In this post I will try to explain the per CPU with vRAM licensing model by using the example below. I hope this will make things a lot easier to grasp. After all it’s about licensing, so it’s about money! And in the end you don’t want to end up in a situation that you’re unable to power-on new virtual machines. In the example we have 2 ESXi host that both have 2 processors. The amount of cores does not matter anymore when using vSphere 5. There is no longer a limitation on the amount of cores or the amount of physical memory in a server. But as mentioned above, VMware has introduced a new limitation with regards to licensing : vRAM entitlement. vRAM entitlement comes with each “per CPU” license. The amount of vRAM depends on the vSphere edition that is being used. So this means that for each CPU license that you buy, you’ll get a certain amount of vRAM entitled. In the example above there are 2 physical CPUs in each ESXi host. Making a total of (2 x 2 = ) 4 physical CPUs you’ll need to license for VMware vSphere 5. In the example I’m using Enterprise licenses, which entitle me to 32 GB of vRAM per CPU license. This makes a grant total of 128 GB of vRAM which I can use. The total vRAM is also known as a vRAM entitlement pool. This is the combined total of all the ESXi hosts managed by a vCenter instance or a set of linked vCenter instances. 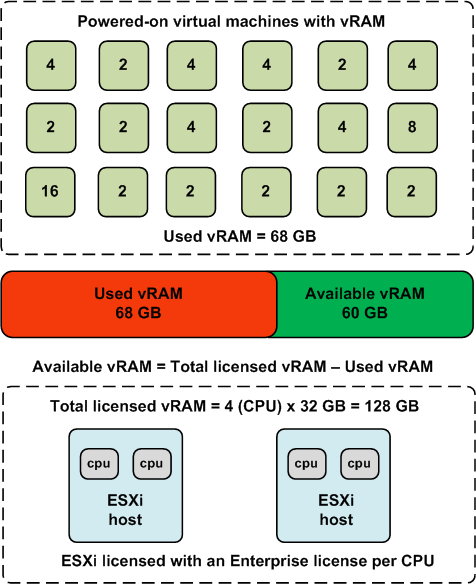 Every vRAM entitlement is aggregated into one pool which can be used by all virtual machines managed by vCenter. The usage of vRAM comes with the amount of virtual machines that is powered-on. Each time a virtual machines is powered-on, licensing will check if enough vRAM is available in the vRAM pool. The amount of vRAM used by the virtual machine is then added to the total amount of vRAM used by all virtual machines combined. The total of the used amount of vRAM must be equal of lower then the total amount of vRAM in the vRAM pool. If this is not the case, the virtual machine will not be powered on and you’ll need to buy more licenses or upgrade to a higher vSphere Edition (if possible). In the example above we have 18 virtual machines, all configured with different amounts of vRAM per virtual machine. The total amount of vRAM used by all virtual machines is 68 GB. So looking at the example again. I’ve got 128 GB of vRAM in my vRAM pool. At this moment I’ve got 18 virtual machines that combined have a vRAM usage of 68 GB. In the end this comes down to 128 GB (Total licensed vRAM) – 68 GB (Used vRAM) = 60 GB of vRAM that still available for new “to-be-powered-on” virtual machines. I hope this gives a good impression of how the vRAM entitlement works in vSphere 5. For more information have a look at the VMware vSphere 5 Licensing, Pricing and Packaging Whitepaper over here. Update : PowerCLI guru Luc Dekens already wrote a Powershell scrip to verify if your vSphere environment is covered by the new vRAM licensing model. See for yourself over here. G0d damnit VMware!!! You’re supposed to be competing with Microsoft’s solution. I have been a VMware fanboy for a few years now, but you keep forcing me to evaluate Hyper-V. This is just another nail in the vSphere coffin. they are winning the licensing war because you are being too damn greedy to compete. We currently have 60 hosts with 2 sockets and 192GB RAM. Currently that requires 2 licenses per host but in the future looks like I will have to go with Hyper-V. Thanks VMware for making me switch due to licensing costs. I think taht the terms “used” and “configured” are being mixed a bit in this article. Be aware that the limit is for “configured” vRAM and not “used”. I get your point. Your right, it should be the configured memory. From a usage perspective you can also say that the VM does not use all the memory is has configured. Let’s put it another way. Usage from my perspective is the amount of memory you configure for a VM which is then used from the vRAM pool. Can somebody explain the scenario? If I have 128GB vRAM entitlement with physically 256GB available RAM on host what will happen if vRAM pool fully utilized and some VMs need memory from parent resource pool. It’s not related to the Resource Pools, but its only related to the hosts in which the VM’s are sitting… If the Physical ESX server has 2 CPU and 128 GB RAM (Where Physical RAM is 256 GB and having Enterprise License) and its vRAM consumption is already fully utilised, then no new VM can be powered on on this Physical Host as the vRAM entitlement for Enterprise licensing is only 64 GB per Socket Licensing. Would like to understand , if a server is with 2 Physical CPU how many vCPU’s can be created and how many virtual machines can be created using the 2 Physical CPU’s. From the above scenario 4 (CPU) * 32 GB = 128 GB vRAM , so what would be the vCPU count ?